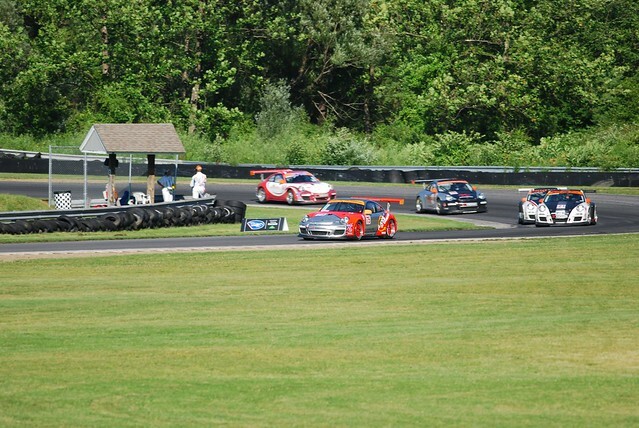 The Axis of Oversteer GT3 Cup saw a lot of action this past week end in gorgeous North Western Connecticut when the IMSA GT3 Challenge by Yokohama series made its first ever stop at historic Lime Rock Park. 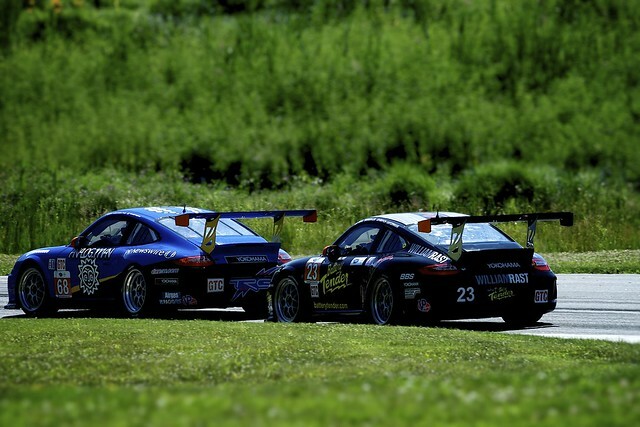 There were two IMSA Challenge races Saturday, one before and one after the week end's main event, the ALMS Northeast Grand Prix. First race was tough for AxisCG who, after gaining a couple of sports on the first lap, had to take the John Deere line through Big Bend to avoid a guy who thought it was a good idea not to use his brakes after a spin and rolling right across the racing line! That was followed by a puncture and it was all downhill from there. Race two was much better with CG again gaining some spots on the start and then defending like mad from the pack of wild coyotes nipping at his heels for the next 45 minutes. It was a great P5 at the end, well done. 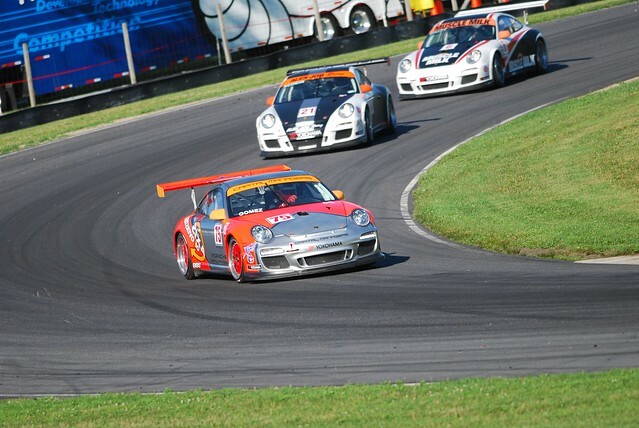 It was a great event, love how ALMS has an open pit policy and the fans can mix with the cars and teams. 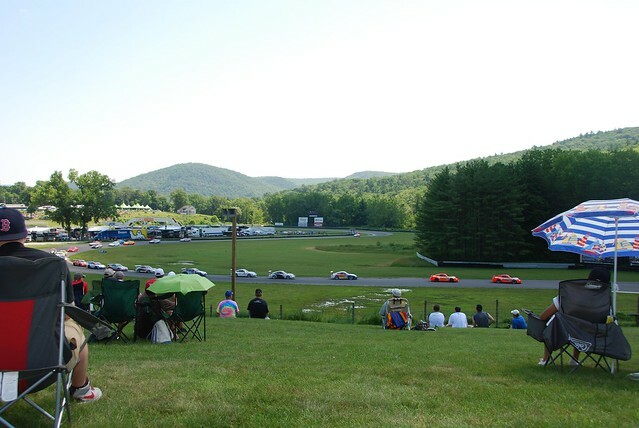 Lime Rock may be tiny but it's great for spectators and the atmosphere is fantastic. 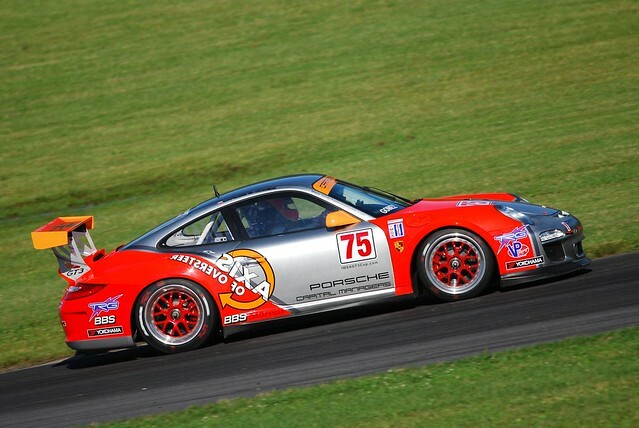 For me the highlight of the week end, aside from watching my friend rip the cup car was when the track announcer mentioned AXIS OF OVERSTEER and what a cool name it was! Nice! 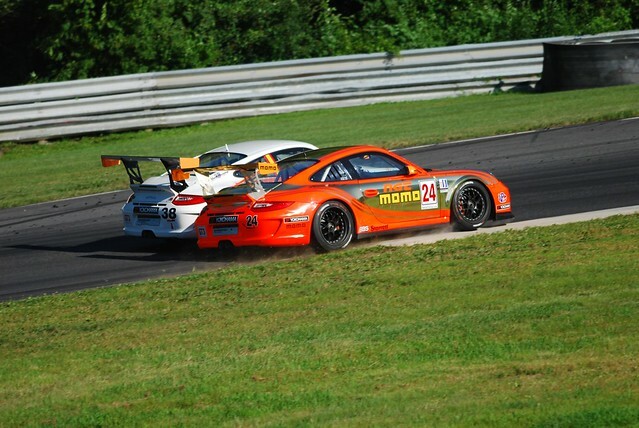 I was very excited for my second IMSA race at LimeRock after having completed (successfully in one piece!) my first race at Montreal during the F1 weekend in very adverse conditions of heavy rain. Good thing was that ALMS and IMSA decided to run only one chicane and West Bend was back in its original fast configuration which I prefer. Got down to business in the first practice. 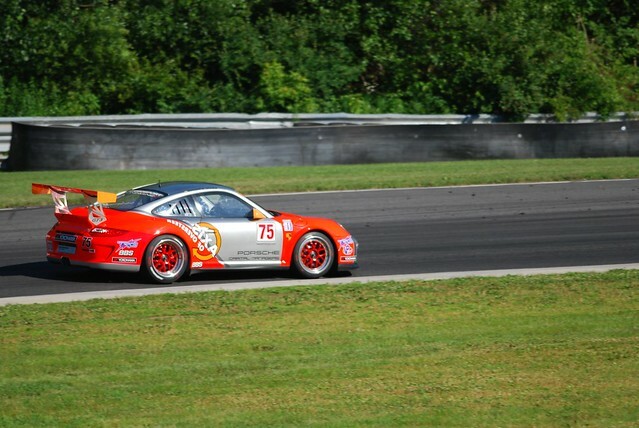 Although I never driven a Cup Car at LimeRock, I have raced that track for the last three years, so it was relatively easy to be in the right line and just having to adapt to the brakes and a lot earlier braking for the uphill chicane. Did a few laps in the 56.3s that put me in P4 within 5/10ths of P1, but almost in the same tenth as the others ahead. I was very eager for the next dry practice or qualifying session to go for a real flyer, but as things turned out that was never meant to be. Rain started pouring all afternoon as soon as our Practice 2 got started and had to change to Rain tires on pit lane. Used Practice 2 to get used to the wet track but brought the car in early as there was no point in taking more risk in a practice session. Qualifying was also in the wet with the best conditions at the beginning of the session when I struggled with too much understeer. Once we had dialed the car and started really pushing hard I couldn’t get down to the times done on those first few laps. 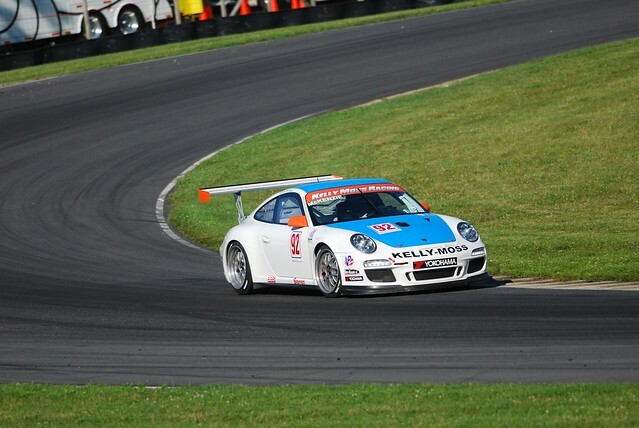 Qualified P9 in the 1:04s, 1.3 secs from Pole, that once again was done by Henrique Cisneros. Hats off to some really over the edge car control in the rain from Henrique. The Axis and kids (AC, AB, kids and me) went for some nice dinner at the Boathouse. Had a good night sleep, early 5 mile run in the beautiful Berkshire surroundings and was ready for some race action. In the last 10 years I’ve never had a flat tire (nor street or race car) other than in my Mountain or Road bike but that’s how my 1st race started! Before the start there was a good amount of optimistic anticipation (maybe they can see the future?) of some racers behind as to when the green flag dropped, and made turn 1 and 2 even more interesting. Preserved my line running 2 and 3 wide through Big Bend, and was conscious of getting a better run in No Name Straight by diving well into the Apex that precedes it. 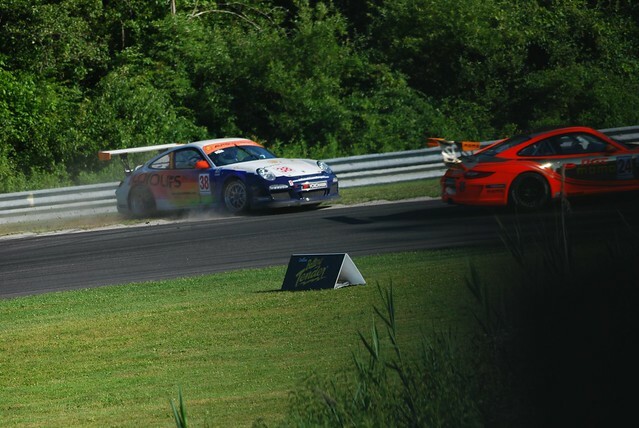 I was able to get a good run on the Orange Cup Car ahead and turn in 1st into the chicane; but real estate narrows down significantly there and got hit on my side and left rear. As soon as I took the downhill turn fast I felt something wrong with the car but wasn’t able to pull into the pits right there as I had an avalanche of Cup Cars coming to my right. Had to crawl (at 60+mph!) for I whole lap that destroyed the flat tire. RACE OVER. Came into pits, changed the tire and came out, almost 3 laps down. Tried having some fun passing cars but as soon as I got to push hard for a good lap the rear would start stepping out significantly. Came into the pits once more and we had the left rear 10psi up in pressure, partially due to pressures being to high initially and also some dragging from misalignment after the lap 1 contact. Once we had the car in better shape, just went out to try a faster laptime for a better starting position, but my fellow racers did the usual antics and we had a 10 lap full course yellow to end the race in a Colorful Cup Car. So yet again, lucky #9 seems to be my number of choice at IMSA as that will be my starting position for Race 2 (same as in Race 1 and Montreal). Got over quickly from my frustration of race 1 by enjoying time with the whole family and Axis friends that came to watch the race. Had a great lunch, watch the fantastic ALMS race under beautiful weather and was very happy to see Mike Piera get his first Pro Win in the GTC car, and an awesome 1-2 for TRG! Had a good start in Race 2, and went through the usual 2-3 wide for most of the first lap and was able to make 3 positions with good passes into the Chicane and Turn 1. But, by then my on track battles have left me few hundred yards behind the leaders, and no matter how hard you try and be 1 or 2/10ths faster, you need 20-30 laps to make a 2-5 sec gap! That’s what makes this races SO hard. 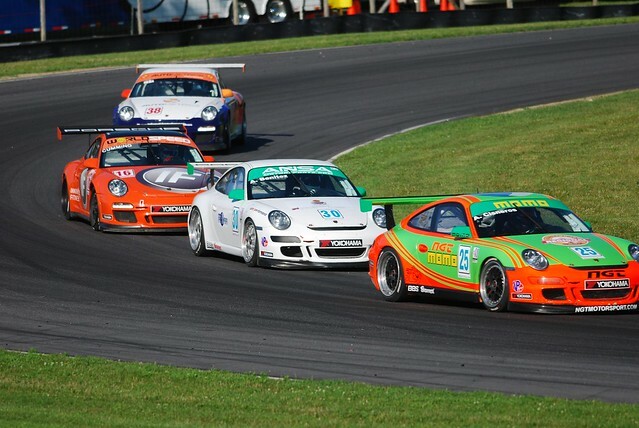 From there on most of my battles came from behind, and had to fight really hard to defend my position with Mark Bullit (who just came back after a P42 in the Porsche Carrera World Cup) and Michael Schein. 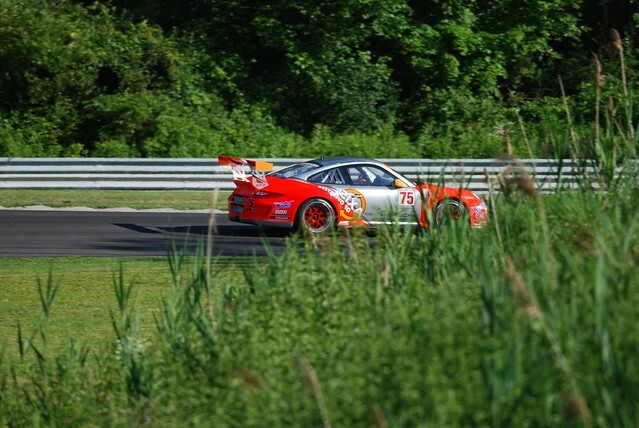 At the end I was up to P4, only to lose one position to Mark Bullit who found grip and speed in his tires and started posting his fastest laptimes in the 56s towards the end of the race while the rest of us struggled to keep the worn, heated tires under us by doing low 57s. I have never fought so hard for 5th place. Towards the last 10 minutes (of the 45min race) I was yelling to my team on the radio to let me know how much time was left while I struggled for grip and didn’t hear anything back as my earphones got disconnected! 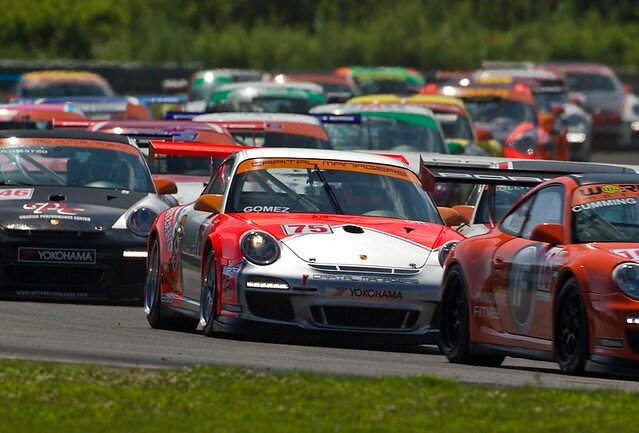 There’s no measured approach to GT3 Cup racing. You have to be at 105% all the time if you want to be running up front. Once you lose contact with the lead its almost impossible to catch up. You decide to take it easy one lap, or 1 or 2 corners and you have a train of 6 cars all over you. 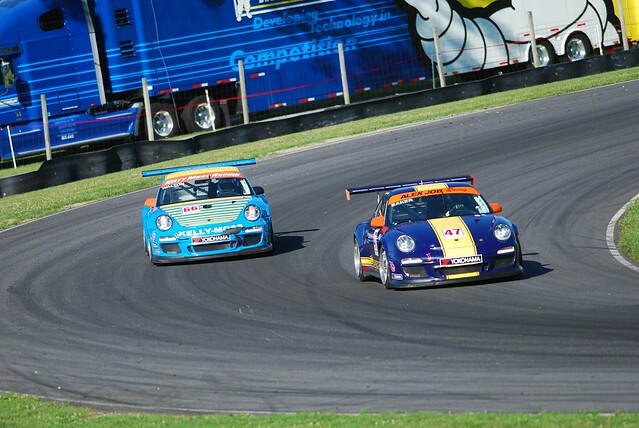 Even an aggressive approach is required in practice and qualifying as you never know when conditions will change and have to go for that ultimate laptime ALL the time. Nevertheless, my measured approach at least allows me to finish the race!, so some of that it is still required. 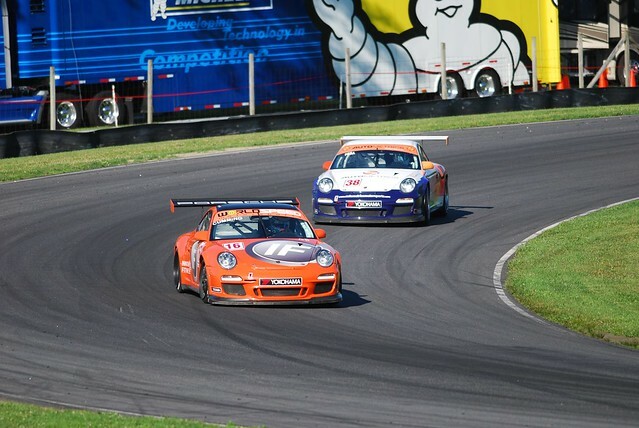 Next race in Mosport, in 2 weeks, will focus on making sure I get myself as far up front as I can in Qualifying, and hopefully have the pace and the guts to hang up there for the race. 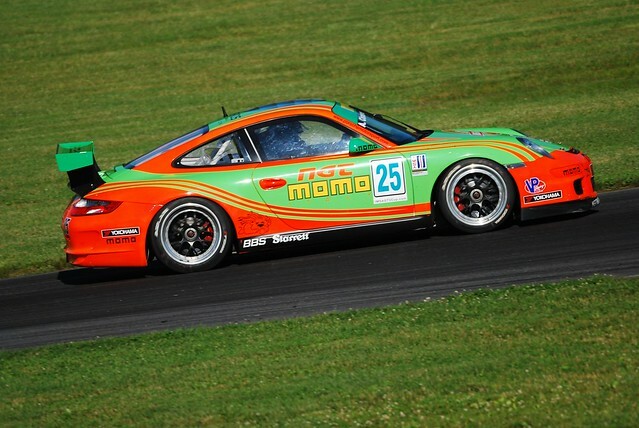 Will have plenty of opportunity to do so, as I plan to run not only the IMSA GT3 Cup (2) races but the GT3 Cup Canada challenge (2 races also), so will have to make quick changes between Yokohamas and Michelins between both series. Can’t Wait!! Thanks to everyone who supported us during the race and stopped by to say Hi or take pictures of our car. I promise to keep trying my best. What's the deal with drivers letting their car roll back onto the racing line? Is it a case of "my race is ruined, now I'll ruin other's" or ??? Great job CG! Thanks for the write up!